The World Baseball Softball Confederation (WBSC) and Peace and Sport today completed a two-day coaching workshop in Jordan aimed at introducing Baseball5 to Zaatari within the “Live Together” Program, the world’s largest camp for Syrian refugees, as part of a new partnership developed with the organisation Peace and Sport. The workshop, which ran from 23-24 January in one of UNHCR community centres in the camp, aimed to teach the basics of Baseball5 to more than thirty local coaches, teachers and project coordinators working at the camp. In the coming weeks, coaches will begin introducing WBSC’s new low-cost and youth-focused discipline to many of the 80,000 refugees living in the densely populated UNHCR run camp. All of the equipment required for the Baseball5 program is being donated by WBSC. During the workshop WBSC organised a number of exhibition games between coaches on the first day and refugees on the second, with participants awarded certificates at the end of the matches. WBSC hopes that Baseball5 will find continuity in the camp and that it will help to improve everyday life of the Syrian refugees. “Baseball5 has increased WBSC’s ability to harness the power of sport and do good around the world. Baseball5 only needs a ball and a flat surface. It’s low-cost and accessible, and allows us to have a positive impact on communities that can tremendously benefit from access to sport. “We are happy to work in collaboration with Peace and Sport and World Baseball Softball Confederation to introduce a new sport to the refugees. 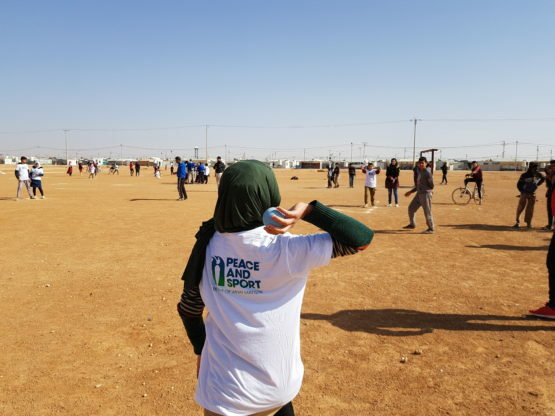 There are several sport fields in the camp providing different opportunities to the refugees aiming to promote peace and gender equality through sport”.